Of course, casual dress is not appropriate every day and for every interaction, and we trust you will consistently exercise good judgment in this regard. All of us know what is and is not appropriate for the workplace. We’re not at all sure about that, but we understand what they’re driving at. “Business Casual” has never inspired much enthusiasm. When the concept first gained currency in Fortune 500 HR departments in the 90’s, the theory was that a more relaxed dress code would appeal to young college graduates, making them happier, more productive, and less likely to be tempted away by Silicon Valley or some other more creative sector. Naturally, confusion reigned as what constituted appropriate business casual dress. Too little thought had gone into what constitutes casual dress that looks business-ready. Men who’d at least known their way around suits and ties found themselves unmoored in a sea of khaki, anxious about how to appear relaxed yet professional. A generation later, business casual remains a vague and poorly formulated concept. Even in more casual workplaces, professional attire needs to be both comfortable and stylish. Something a bit more elevated than what you might wear on the links or at a backyard BBQ. While we may all be dressing a bit more casually these days, in the age of Instagram we’re likely to judged more by what we choose to wear, not less. Younger professionals in particular, freed from official dress codes but generally still subject to unwritten standards like Goldman’s, will appreciate the continuing need for a smart appearance on the job. The easiest way to put together a professional wardrobe in this spirit is to keep it tightly edited. By focusing on a core of simple, versatile, high-quality basics, you can establish a foundation of interchangeable pieces, to which you can add personal touches to as you go along. The idea is to achieve a working stylishness that distinguishes you with without drawing attention to your clothes. Below are a few pieces to consider. While the basic elements are nothing new, we hope to offer a bit more insight into how to make the right choices for each piece, and how small details can make a significant difference. The navy sport jacket - A versatile classic and the obvious choice, but this need not be your father’s blazer. Trade clubby brass buttons for sleeker gunmetal or even horn or corozo. Patch pockets impart a knockabout look that can crisp up with a white shirt and tie but prefers an open collar. A traditional breathable wool hopsack is hard to improve on, and you can opt to keep it unstructured and unlined for maximum slack (like this one pictured). When well-designed, no single garment is more flattering to a man’s figure or as versatile, as it can be dressed up with a necktie or dressed down with chinos and a crewneck. Livelier blues are nice warm-weather variations on the theme, but keep in mind the brighter the blue, the more casual the jacket. An alternative sport jacket - This can be a lightweight jacket that appears solid from a distance, but is actually a subtle pattern like a herringbone, muted check, or our personal favorite - featherweight wool and silk seersucker. It can be particularly interesting to go with an alternative take on the blazer - in unexpected solid colors like a subtle green, maroon, or wheat. In less-restrictive environments, bolder patterns like glen plaids and windowpanes are fun to wear, and tend to look best when the rest of the outfit is kept rather simple. Or, forego the classic sportcoat cut altogether in favor of something like our slack jacket, made in fabrics that wear more like a sweater. Odd wool trousers - Grey and tan are the foundational, wearable with almost anything up top. (We strongly suggest leaving navy trousers to their rightful place as suit bottoms.) From there it’s easy to branch out into different textures and color shades to add a bit more interest. 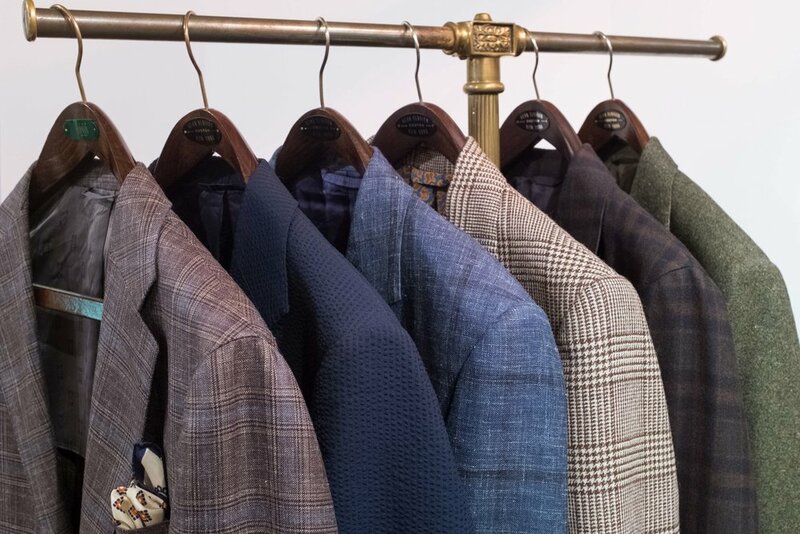 Choose seasonal cloths with a touch of sophistication: cozy flannel or cavalry twill in winter and crisp tropical worsted wools and blended fabrics for summer. Whether pleated or flat front, a higher waist is flattering, comfortable, and more professional than trousers riding on the hips. A fit tapered down to a trim (but not tight) leg line keeps it modern. Custom tailored details like extended tab waistbands, side-adjusters, belt-less DAKS waistbands, and open lap side-seams will subtly elevate your style without raising eyebrows. Cotton chinos - A step below wool on the formality scale, luxuriously soft cotton can be rendered either as traditional dress trousers, or with a five pocket jeans-cut for a more casual approach. These lightweight cotton trousers are actually suit bottoms, but pull double-duty as great separate trousers. Belts - The belt becomes more prominent in the absence of a jacket, and a good place to show a little personality, no less a flush of solvency, is with a dark brown alligator (above) or classic honey brown ostrich. Bolder dress shirts - As more professionals are forgoing jackets in warmer weather and neckties year-round, the dress shirt has assumed greater prominence, offering an opportunity to show a bit more flair than the standard white or light blue solid. There are endless options here, but we often suggest solids in more interesting colors like a strong lavender or ecru, and stripes and checks of varying widths and scales in highly wearable colors. Button-down collar shirts - Because its collar sits up and frames the face when worn open, this American icon is all the more essential as fewer men are wearing neckties. We like ours with a longer, super-soft collar with a gentle roll and a bit of spread for a more modern look. If your shirts sport a taller front collar band, adding an offset two-button band is another unique touch. Pocket squares - Alan frequently points out that the simple white linen pocket square is the least expensive way to make an inexpensive jacket or suit look more upmarket. In the absence of a necktie, a colorful silk, wool, or cotton printed pocket square can really enliven an otherwise conservative outfit. This printed cotton pocket square give a pop of interest to an otherwise quite conservative look. Shoes - Once again, in this pared-down dress aesthetic, shoes become that much more important, and good shoes make great investments in your appearance. For our go-to business casual shoe, we like a sleek dark brown slip-on loafer like the St. Crispin’s 539 (also shown in our interview with Leffot’s Stephen Taffel) or the Alden 683. With a slightly more shaped, pointed toe and simple detailing, this is a style of shoe that can do multi-service for day, evening and weekend. Tonally, the color of the shoes and pants should be in the same ballpark: dark brown calf or suede with navy or charcoal, and lighter brown or tobacco shoes with lighter shades of grey and tan. No discussion of modern work attire would be complete without mentioning the fleece vest. Although undeniably comfortable and widely accepted as appropriate, they’re not exactly the most flattering article of attire, and their ubiquity has made them something of a cliché, which means their moment is already passing. Call us biased, but we recommend discovering how comfortable tailored clothing can really be when it’s properly made to move with your body. Fit is the soul of elegance, and elegance never goes out of style.